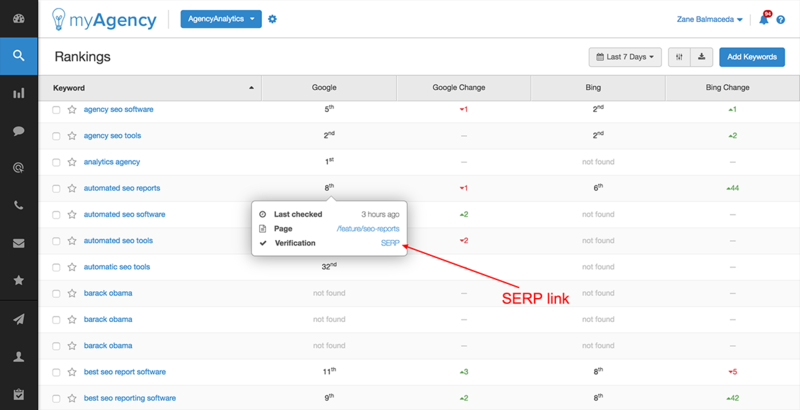 SERPS can be verified in the dashboard for tracked keywords by using our "SERP link", with a screenshot of the most recent SERPs. Start in the Rankings module where you'd like to verify keywords. With your mouse, hover over either the numerical ranking or the "not found" designation for the keyword that you'd like to verify. After about one second, a fly-out window will appear, showing the page that's ranking, the time of the last rank fetch, and the SERP link. You can either click the SERP link, or right click it to copy and paste the link into your browser's address bar. This link will provide an interactive screenshot of the SERPs as they appeared to our system when the most recent SERP fetch operation was completed for the keyword in question. How does AgencyAnalytics fetch rankings?